Waterfront 4 Bedroom on Crystal Lake in Orleans. This well appointed 4 bedroom has recently been fully updated. It has central AC throughout the home and it is quite spacious! Upper and lower floors all have lake front views. The main level has an eat in kitchen with mini bar with seating for 4. There is a large farmhouse style dining table with seating for 8 people. Large sliders open to the waterfront deck, there is also outdoor dining for 8. The main floor has a spacious living room, complete with large flat screen Smart TV and another set of sliders to the deck. Just beyond that there is a full bath with tub/ shower combo and 3 bedrooms. The first bedroom has a king bed. One bedroom has a Split King (or 2 twins) and the other has two Twins. Down on the lower level, with direct access to the back yard there is a bedroom suite equipped with a queen bed, full bath with stand up shower, flat screen Smart TV and its own efficiency kitchen. The suite also has a pull out couch with a twin mattress. Just down the hall there is media room with reclining couch, large flat screen Smart TV, bar area, second fridge and a half bath. The washer and dryer are also on this level. Access to the backyard and lake are steps outside the door from the Queen bedroom on this level or through the sliders from the downstairs living room. There is a nice yard leading down to the waters of Crystal Lake. This entry is unique in that only two houses have access and it is quite sandy and perfect to enter for swimming, kayaking, paddle boarding etc. Head out on the lake throughout the day as the whim strikes you. Or enjoy world renowned Nauset Beach on the Atlantic Ocean under 10 mins away and come home to your lakefront oasis to wash off the salt! NOTES: This home is lakefront and shares a driveway entrance with the home behind it. It also shares access to the pond via the small landing to the pond in it's back yard. People renting the home behind it can access the pond through walking past the side of the home and into the backyard. Nauset Rental also manages the rental of the other home. In the morning, you will see swimmers and stand-up paddleboarders traversing the one-half mile long stretch of the lake. During the day, you will see people in sailboats and on rafts and inter-tubes leisurely floating across the lake. During the evening, you will see people kayaks and canoes enjoying the calm waters and sunsets. At night, you will see incredible stars and hear sounds of bullfrogs and loons. Waterfront access to Crystal Lake right behind the house! Good variety of properties to choose from and a very responsive staff. Great house; great location. The lake is a treasure. Quiet but close to town. Very fun to be at beach in the morning, then be in fresh water in the afternoon. 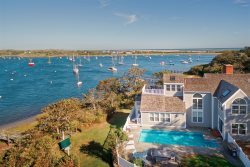 This home was one of our favorite rentals and we have been coming to cape cod and Nantucket for over 30 years. Very relaxing in Orleans. Quiet and beautiful lake serenity. The home at crystal lake is serene and beautiful. Our family enjoyed spending time on the freshwater lake swimming, paddling and we rented some kayaks. The home had everything we needed and was updated beyond our expectations. The beds were comfortable and felt almost new. This home had everything to accommodate a busy family on the cape. We want to return for a longer rental next season.